Record Full HD 1080p video with this Class 10 compliant 16GB Ultra UHS-I SDHC Memory Card from SanDisk. With enhanced data read speeds of up to 80MB/s this Ultra SDHC memory card is designed to suit the needs of compact and mid-range point and shoot cameras. You can also save and store a variety of files such as music, movies, documents and more. The writable label found on the card allows you to write down what is saved to the card while the built-in write protect switch helps to prevent accidental data loss. 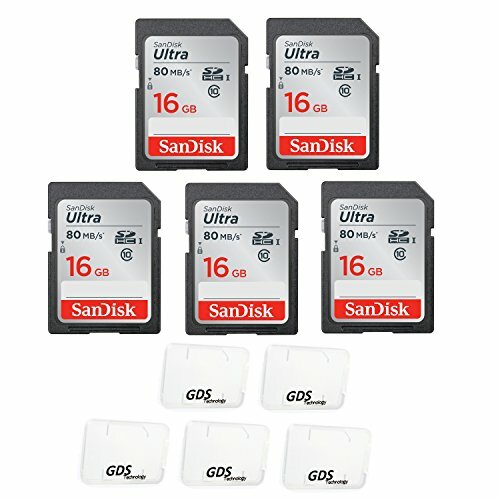 This card, as with most SanDisk cards, comes waterproof, temperature proof, x-ray proof, magnet proof, and shock proof to take your files with you nearly anywhere you go. Class 10 performance for Full HD Video (1080p) Read speeds up to 80 MB/s Writable label for easy identification and organization Engineered with UHS-I bus architecture.